Today the latest results from the BICEP2 telescope in Antarctica are out. And boy, are they exciting! They provide stark evidence for two widely believed theoretical predictions, namely inflation and gravitational waves. The authors are already being tipped for a Nobel prize. So what’s the science behind this magnificent discovery? It’s easiest to start with the name of the telescope. BICEP stands for “Background Imaging of Cosmic Extragalactic Polarization”. That means looking for signals from the Big Bang. Cool, huh? After the Big Bang the universe was a hot dense soup of particles. Eventually (380,000 years later) things were cool enough for the universe to become transparent. Particles could bind together to form hydrogen atoms, emitting light in the process. Nowadays we see this ancient light as microwave radiation covering space. The most ancient light in the universe as captured by a NASA probe. The different colors indicate the intensity of radiation recorded. 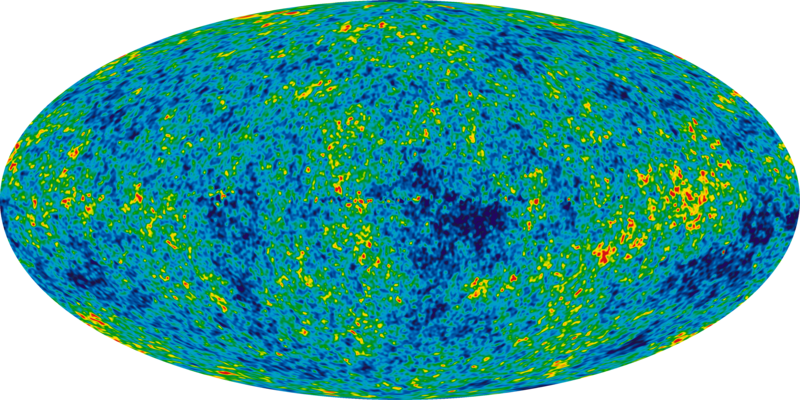 This cosmic microwave background (CMB) has a particularly puzzling feature. It’s much more uniform than we should expect from a generic Big Bang explosion. Intuitively most explosions don’t generate exactly symmetrical outcomes! What’s needed is some mechanism to smooth out the differences between different parts of space. Here’s where the idea of inflation comes in. A fraction of a second after the Big Bang we think that the universe blew up at an astonishing rate. This happened so fast that there was no time for inconsistencies to creep in. The result – a uniform cosmos. It’s certainly an appealing explanation, but the problem is that there’s been little direct evidence. Until now, that is. Cosmologists on the BICEP project were looking for a particular signature from inflation, and it seems like they’ve found it! To understand their method we need to know something about light. A wave of light can oscillate in different directions perpendicular to its path. A light wave coming into your eyes from your screen will oscillate somewhat up-down and somewhat left-right. These two options are known as polarizations of light. It turns out that you can measure exactly how light in the CMB is polarized. This is useful because inflation produces a particular polarization pattern called a B mode. It’s taken decades to locate this smoking gun, but now the BICEP team have done it. Hang on, couldn’t these B modes come about some other way? Probably not. The B mode pattern we observe seems to arise from the interaction of light with gravitational waves. And to get enough of these we need inflation. Or perhaps this effect is an observational fluke? According to the paper, we’re 99.999999% sure it isn’t. It’s worth pointing out that this result is a double whammy. It confirms theories of inflation and gravity. Nobody has yet detected a gravitational wave, despite the fact they’re theoretically an easy consequence of Einstein’s general relativity. This latest development is further indirect evidence of their existence. Back in the early 80s, nobody was much interested in string theory. Some wrote it off as inconsistent nonsense. How wrong they were! With a stroke of genius Michael Green and John Schwarz confounded the critics. But how was it done? First off we’ll need to understand the problem. Our best theory of nature at small scales is provided by the Standard Model. This describes forces as fields, possessing certain symmetries. In particular the mathematical description endows the force fields with an extra redundant symmetry. The concept of adding redundancy appears absurd at first glance. But it actually makes it much easier to write down the theory. Plus you can eliminate the redundancy later to simplify your calculations. This principle is known as adding gauge symmetry. When we write down theories, it’s easiest to start at large scales and then probe down to smaller ones. As we look at smaller things, quantum effects come into play. That means we have to make our force fields quantum. As we move into the quantum domain, it’s important that we don’t lose the gauge symmetry. Remember that the gauge symmetry was just a mathematical tool, not a physical effect. If our procedure of “going quantum” destroyed this symmetry, the fields would have more freedom than they should. Our theory would cease to describe reality as we see it. Thankfully this problem doesn’t occur in the Standard Model. But what of string theory? Well, it turns out (miraculously) that strings do reproduce the whole array of possible force fields, with appropriate gauge symmetries. But when you look closely at the small scale behaviour, bad things happen. More precisely, the fields described by propagating quantum strings seem to lose their gauge symmetry! Suddenly things aren’t looking so miraculous. In fact, the string theory has got too much freedom to describe the real world. We call this issue a gauge anomaly. So what’s the get out clause? Thankfully for string theorists, it turned out that the naive calculation misses some terms. These terms are exactly right to cancel out those that kill the symmetry. In other words, when you include all the information correctly the anomaly cancels! The essence of the calculation is captured in the image below. Any potential gauge anomaly would come from the interaction of particles. For concreteness we’ll focus on open strings in Type I string theory. The anomalous contribution would be given by a -loop effect. Visually that corresponds to an open string worldsheet with an annulus. We’d like to sum up the contributions from all (conformally) inequivalent diagrams. Roughly speaking, this is a sum over the radius of the annulus. It turns out that the terms from exactly cancel the term at . That’s what the pretty picture above is all about. But why wasn’t that spotted immediately? For a start, the mathematics behind my pictures is fairly intricate. In fact, things are only manageable if you look at the term correctly. Rather than viewing it as a -loop diagram, you can equivalently see it as a tree level contribution. Shrinking down the annulus to makes it look like a point. The information contained in the loop can be viewed as inserting a closed string state at this point. (If you join two ends of an open string, they make a closed one)! The relevant closed string state is usually labelled . Historically, it was this “tree level” contribution that was accidentally ignored. As far as I’m aware, Green and Schwarz spotted the cancellation after adding the appropriate term as a lucky guess. Only later did this full story emerge. My thanks to Sam Playle for an informative discussion on these matters.